If you are looking to purchase your first juicer and the Braun Juicer MP80 may be a good place to start. These are considered entry-level machines and are available online. You may be able to find these machines online or through a local retailer, it is important to note that Braun is no longer producing this particular model. This could make parts a little more difficult to come by, however as you will see these machines rarely require servicing! They have a reputation for years of flawless service. Low Price- the first thing you will notice about the Braun Juicer MP80 is the price; you can pick up this unit online for less than $100. This is significantly cheaper than many centrifugal juicers on the market today. Speedy- This little juicer is fast! It is perfect for times when you want a quick cup of juice or for small batches. Reliable Motor- though it is only 250 watts this is a tough little motor. Consumers report this machine going strong for over 10 years with absolutely no motor problems. Great for Beginners– If you have never juiced before this is the perfect unit to start with. It is simple to use and even easier to clean up so you can experiment with different fruits and vegetables until you find the taste you prefer. Noisy– You probably do not want to plan to use this machine late at night or first thing of a morning! This juicer is quite noisy and if you have, close neighbors you might want to make your juice in the afternoon and store it for that early morning pick me up. Small Chute Size– in order to use this juicer you will need to cut your produce into smaller pieces. The chute is somewhat small; however, it is perfect for the size of the motor. If you tried to use larger pieces or whole fruit, you would quickly burn up the motor. 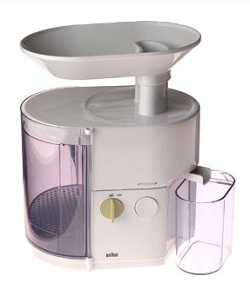 Pulpy Juice- There are several issues with pulp and the Braun Juicer MP80. First, you can expect your juice to be a bit pulpy, for many this is not an issue but you should be aware of it up front. Cleaning the basket will be necessary during the juicing period as it builds up and the juice cannot get through. The Braun Juicer MP80 is a small compact juicer that will fit comfortably in even the smallest kitchen. It does have a variety of pros and cons, but for a first time juicer this is definitely a machine you should consider. It is very easy to use, easy to clean and cheap enough for most budgets. Use this centrifugal juicer as a starter device. 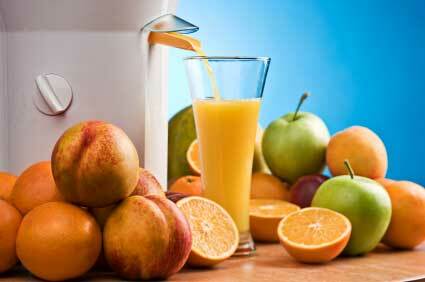 However, if you are looking to get serious about juicing, there are better juice extractors available.